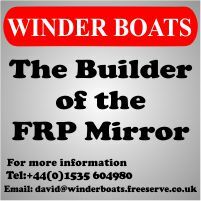 "There is enormous satisfaction to be gained from building and racing your own boat" - a quote by Guy Wilkins from his book "Mirror Racing". When the Mirror dinghy was designed in the early 60's, the Daily Mirror newspaper wanted a boat that in kit form was simple enough for a teenager to assemble with perfetly commonplace tools. The construction method used on the first prototype which Barry Bucknell, a TV handyman, had built for his son, fitted the bill perfectly. Instead of the traditional method of using softwood battens inside the hull where the plywood panels were joined, Barry used one of the simplest and oldest boat building methods know to man: sewing. The Vikings used it on their ships. The Polynesians still do. They "stitch" the skin of a hull together - then waterproof all the seams. So Barry borrowed the method used by Ken Littledyke to make KL canoes. The edges of the plywood panels were "stiched" together using copper wire. With the panels held in place in this manner, the joints between them were made permanent using glass fibre tape and resin. This method is now commonly know as "stich and glue" construction and is now widely used for wooden dinghy construction. A frequently asked question is "Can we build it easily and quickly?" The answer is "yes". 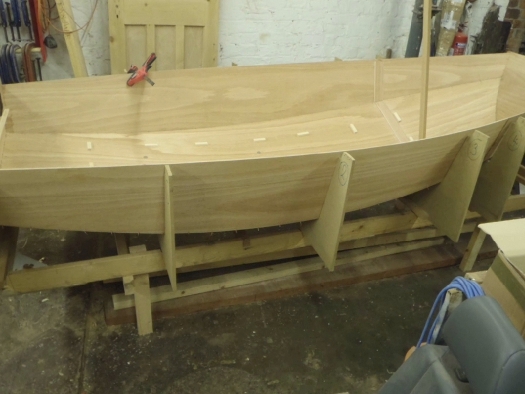 Thousands of ordinary people have built a Mirror dinghy from a kit. A group of nine schoolgirls completed the hull at an exhibition in eight hours! Apart from a kit (available from a licenced kit manufacturer), these are the things you need to provide as a minimum. A bit of spare time - about one hundred hours - that's a month of evenings and weekends, should see your boat ready for painting. A few simple tools - no sophisticated equipment is necessary but, although you don't need an electric drill, it does save a lot of time. If you are tempted, why not have a look at this short video presentation of the building of Mirror 70670 by Ben Hill? Then browse through the building instructions to get a good idea of what is involved. If you want to use a jig to hold panels together, rather than use the traditional "stitching" process, the UK Mirror Class Associtaion has a jig available for members to borrow to build Mirror kits on.